Crap comes in many different forms – cow crap, chicken crap, runny crap, old crap, bull crap, and the crap the lads talk at the local watering hole on a Friday night. 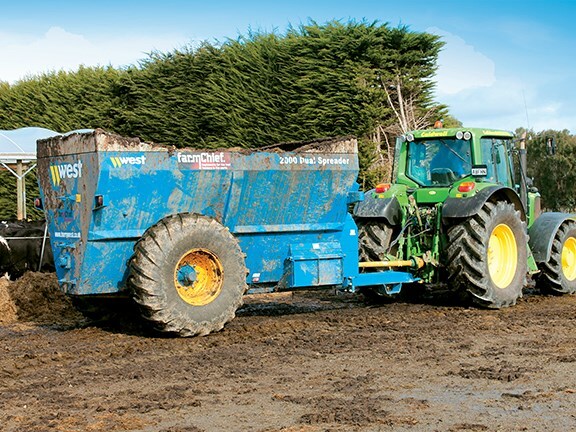 In farming terms, making use of this farming by-product has become an important aspect of nutrient and environmental management, so Mark Fouhy checks out the West Dual 2000 effluent spreader. Farmers in the European Union have been housing stock in barns to protect their soils through winter for some time, and have developed the tools to help manage this slurry and manure waste. The West Dual 2000 is one such machine, manufactured in the workshop of Harry West in North Shropshire, England. The original West Dual spreaders were rolled off the production line back in 1979, receiving awards for design and innovation at the Royal Show in 1982. Not a lot has changed on the West spreaders over time, with many of the original design features remaining on current models. Small changes have been made to sprocket sizes, just to alter the feed rate of material to the side spreader unit from the triangular-shaped, sealed-tub body. Recently, I caught up with Bevan and the team at Caldwell Contracting in the deep south of New Zealand’s South Island. Why head all the way down there? Well, with three West Dual 2000 spreaders in their fleet of tractors and machinery purchased through Farmchief Machinery, they know what they are talking about. 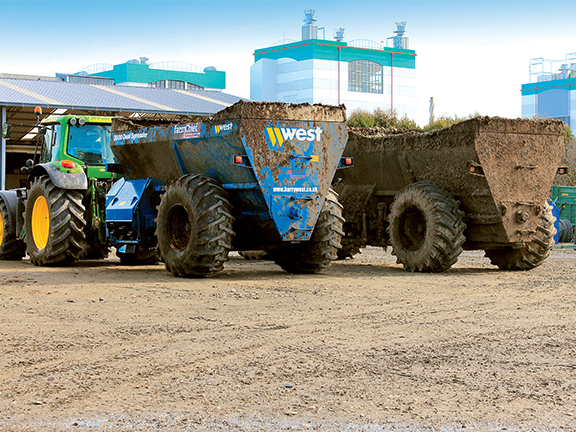 In their business, Bevan uses the West Dual spreader machines predominantly for spreading waste from weeping walls and feed pad muck, which is scraped up and collected in a sump – similar to the job they were originally designed for. That said, they can also be used to spread a multitude of different things like laneway cleanings, woodchip, and calf bedding. Unlike a standard fertiliser spreader, which tends to block when spreading wood chip (yes, I speak from personal experience), the large moving sidewall helps prevent material bridging above the feed auger. This prevents it reaching the spreader on the side of the machine in this case, or at the rear of a fertiliser truck. Bevan had organised some muck and a paddock to spread it onto, with one of his regular clients just five minutes down the road. The low loading height of 2.35m allows these machines to be loaded by a tractor with front-end loader, although the large bucket of the JCB Loadall did get both machines loaded up pretty quickly, so we could get onto the job of spreading faster. Optional splash guards can be fitted on the front and rear to minimise spillage of loads with high water percentage. However, given the work these machines are designed for, it is inevitable that they are going to get dirty. The quality of paint and finish should help protect the machine from corrosion through its life. Washing and leaving it under cover will also help with this a great deal. 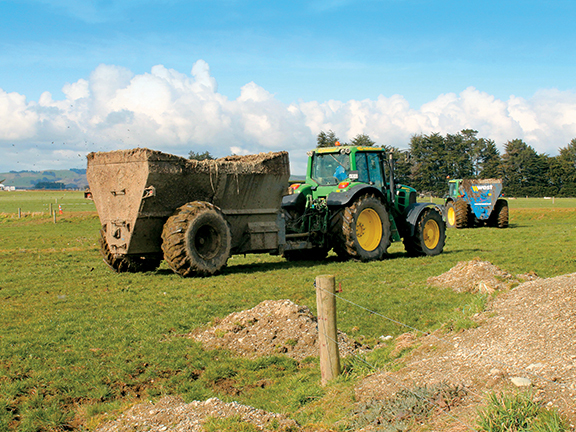 Slurry spreading is not an exact science, and so the spread of one load to the next is bound to vary. The West is said to have a spread pattern of 21m, although, on some products, I would imagine this may stretch out to nearer 30m and others closer to 15m. With the wet slurry product we were using, an even spread was achieved of around the 15-20m mark. The West design utilises simple sprocket and chain drives to give the appropriate speeds to feed material from the auger into the side spreader unit. This minimises horsepower requirement to run the machine, and also reduces ongoing maintenance costs through not requiring a gearbox. The downside is that the spread of the West Dual is to the left of the machine, which is a slightly less natural position for the operator. Anyway, two West spreaders at work in one paddock is pretty impressive, and the only thing better is three West spreaders – something you don’t get to experience often. It pays to watch out as, with such a spread, they could well be spreading crap in your direction. Late winter/early spring is a tricky time of the year to get machinery on paddocks, but the West Dual spreaders with their large flotation tyres seem to handle the job just fine. 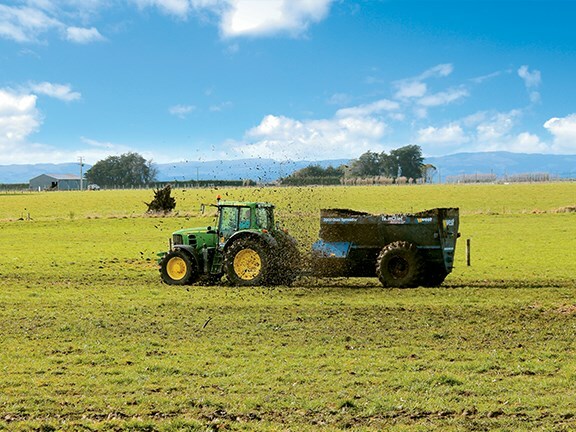 With a single axle, scuffing during turns is minimised, and the large tyres cover the job of minimising soil pasture damage while also acting as the suspension for the machine, allowing the axle height and overall machine height to be kept down. Some of the key points of the West spreader are that it is easy and safe to operate. 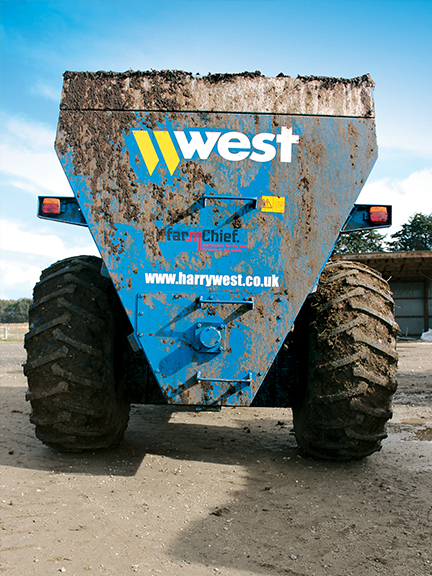 The V-shaped bin keeps weight when loaded down low, minimising the risk of a rollover on hilly terrain. Also, the auger to feed the material to the side spreader unit brings the material forward, keeping the weight on the tractor to help maintain traction. With the use of simple sprocket and chain drives, the power requirement is kept down to a mere 70kW or 95hp, with a PTO speed of 540. For our test drive, Bevan had the West spreaders on two John Deere 6930s. A few extra horsepower is always good to avoid having fully loaded implements pushing you around. When operating, a simple coloured gauge tells you how wide you have the door open when spreading. 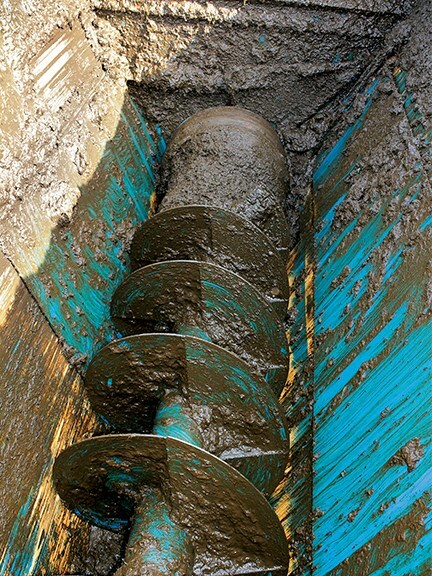 Teeth on the 900mm spreading rotor are spaced closer together at the front where the door opens horizontally to aid the spread of more liquid-type loads. The teeth are reversible, doubling their life. The amount of time the teeth will last depends entirely on what you are spreading. The bottom side of the spreader is double-spring loaded. This allows the odd lump to make its way through without causing a blockage. The other safety feature is a stone trap on the right-hand side to catch any rocks or other foreign objects likely to cause damage. As with all spreaders, it pays to be careful when loading to avoid any posts or lumps of concrete. As I said at the start of the article, crap comes in many different shapes and forms, which makes it difficult to handle and achieve the best results from one machine. With the West Dual spreader, I believe you are equipped to handle wet muck perfectly, and also to spread dry products if required. From one slurry tanker a few years ago, Bevan and the Caldwell Contracting team have certainly amassed a serious array of tools for dealing with farm effluent waste. The fleet now consists of a two tankers, an umbilical hose spreader system, two rear-discharge K2 muck spreaders, and three West side-discharge muck spreaders, allowing them the tools and capacity to effectively and efficiently manage effluent waste. Find new and used spreaders for sale in our classifieds.